Posted on October 24, 2016 October 24, 2016 , in Swim Spas. Although swimming pools and swim spas may seem like similar investments, there are huge differences between the two. Costs, maintenance, and versatility are all factors that buyers must take into account before making a final decision. Below, you’ll learn exactly what to look for to make the perfect choice for your lifestyle and budget. Depending on what kind of swimming experience you’re looking for, you’ll find that swim spas and swimming pools offer very different things. If you’re a competitive athlete or ready to get in serious shape, a swim spa can offer you workout challenges that a swimming pool cannot. For one, a swim spa allows you less rest. In a small swimming pool, you may reach the wall after just a few strokes. At that point, it’s easy to stop and rest, especially if you aren’t skilled at flip turns. In a swim spa, however, you won’t have the opportunity to stop and rest on the wall. You’ll be challenged to swim against the current for the duration of your workout. This will cause faster improvements in your fitness level. Consistency is key to any exercise plan, and a swim spa offers you the ability to work out every day of the year. While you can only swim in an outdoor pool for around three to four months per year, you’ll have access to far more workout days when you choose a swim spa. Swimming pools can provide a lot of fun for users. Diving boards and cannonball contests are some of kids’ favorite activities. But many families are looking for more versatility so that they can meet the needs of all users. One of the best things about a swim spa is that it can function as a gym, hot tub, wave pool, and pool all in one package. Kids will have just as much fun splashing in the waves while adults can sit back and relax with a hot tub massage or challenge themselves to an intense workout. If fun is your priority, a swimming pool is a good choice, but when you want a wider range of options, a swim spa is the way to go. If you’re looking to save energy, a fully insulated swim spa is a great way to do so. Not only can a swim spa trap heat to keep itself warm, but it can also reuse this heat to save you money on energy costs. They offer outstanding year-round savings compared to the cost of heating a swimming pool. The amount of time and money you’ll need to install a swim spa versus a swimming pool is a major difference between the two. 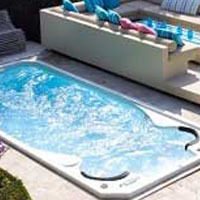 A swim spa offers savings of time and money as it can be installed in around three days at a cost of $22,000 to $50,000. A swimming pool, on the other hand, can take up to four weeks to install at a cost of $45,000 to $100,000. Many people who are considering investing in a swimming pool or swim spa forget to calculate the cost of extra necessary expenses like safety covers. Safety covers are not cheap. A swimming pool cover can cost anywhere from $3000 to $5000. Swim spa covers cost between $1200 and $2000. It’s also important to consider the ease of use. While swimming pool covers are often cumbersome to put on and remove, swim spa covers feature easy locking features and allow you to put them on in just a few minutes. Because heat evaporates from the surface of a swimming pool, pools can be expensive to keep warm when the temperature drops. While a swimming pool requires year-round heating, a swim spa does not. There are many swim spa options that are energy-efficient and less expensive to heat even during cold weather. Swim spas also save energy by trapping and reusing waste heat. Because they come equipped with insulated hard covers that trap heat during summer, you will not need to heat your swim spa at all during the summer months. A lot of equipment is required to maintain a swimming pool including skimmers, vacuums, and robotic cleaners. These costs can quickly add up and maintaining a swimming pool can be extremely time consuming. If you invest in a high-quality swim spa, there are self-cleaning options made by Hydropool that can clean the bottom and surface to prevent the need for skimming and vacuuming. This will give you more time to spend with your friends or family, or doing other activities that are important to you. Swimming pool liners can be pricy and must be replaced relatively often, around every 10 to 15 years. Swim spa shells, however, do not require replacement. When deciding between a swimming pool and swim spa, remember that additional costs can quickly add up. Hopefully this blog post has helped you to better understand the major differences between swimming pools and swim spas so you can make the right decision.